Don’t be caught off guard, whether you’re dealing with the daily smaller issues, or you’re trying to solve business problems that could affect your ability to stay afloat. These 10 problem-solving tools and techniques are proven to help. When you have a lot on your plate and you realize your sales are dropping, your first inclination might be to rush into putting together a tactical plan to increase sales. It’s not a bad inclination, but what if decreasing sales are just a symptom of the real problem? When you define the problem, you want to be sure you’re not missing the forest for the trees. Team: Are there any issues affecting your team? Do they have the tools and resources they need to succeed? Competition: Is a competitor’s promotion affecting your sales? Is it a short or long term problem? Business model: Is your business model sustainable? Is it realistic for how fast you want to grow? Economy: How are world events and the nation’s economy affecting your customers and your sales? Goal alignment: Is everyone on your team working toward the same goal? Have you communicated your short term and long-term business goals clearly and often? There are a lot of ways to approach the issue when you’re facing a serious business problem. The key is to make sure you’re getting a full snapshot of what’s going on so you don’t waste money and resources on band-aid solutions that might be a temporary fix, but that won’t have any real effect on the deeper issue. If you’re concerned you might have blind spots, good! Every leader has them. Tools like SWOT analysis can help you be more thorough when you’re looking and where you are and what you need to do next. SWOT stands for strengths, weaknesses, opportunities, and threats. A SWOT analysis usually starts with a matrix. Read more about how to do a SWOT analysis here. All good businesses solve some sort of problem for customers. What if your particular business problem is actually an opportunity, or even a strength if considered from a different angle? SWOT is a great tool for strategic planning and bringing multiple viewpoints to the table when you’re looking at investing resources to solve a problem. 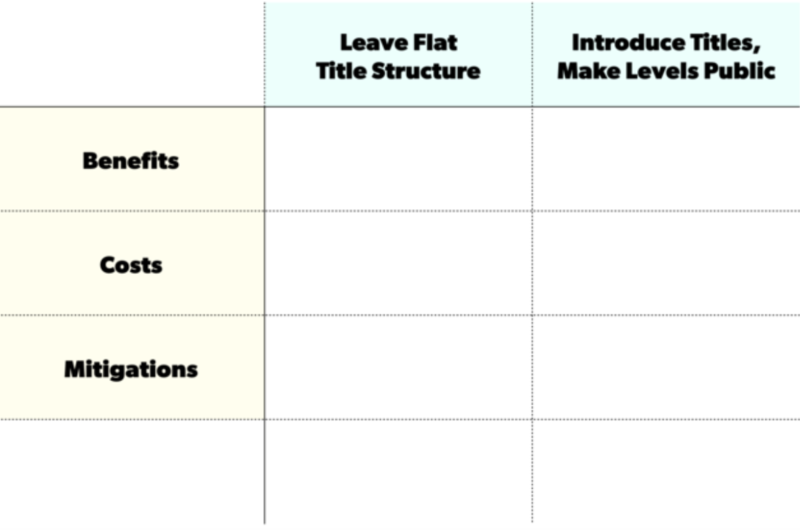 When you’re finished doing your SWOT analysis, check out this guide for turning your results into actionable strategies. You might also consider the design thinking approach to problem solving. It’s often used by organizations looking to solve big, community-based problems. One of its strengths is that it requires involving a wide range of people in the problem-solving process. Paul Graham is a computer scientist and an entrepreneurial guru; Rod Ebrahimi reports for Fast Company that one of the things he learned from Graham about running a business is that successful businesses solve real problems. This approach—applying your company’s skills and expertise to a problem in the market—is the basis for design thinking. It’s not about finding the most complex problems to solve, but about finding common needs within the organization and in the real world and coming up with solutions that fit those needs. When you’re solving business problems, this applies in the sense that you’re looking for solutions that address underlying issues—you’re looking at the big picture. Market research and customer outreach aren’t the sorts of things small business owners and startups can do once and then cross off the list. When you’re facing a roadblock, think back to the last time you do some solid market research, or did a deep dive into understanding the competitive landscape. Market research and the insights you get from customer outreach aren’t a silver bullet. A lot of companies struggle with what to do with conflicting data points. But it’s worth struggling through and gathering information that can help you better understand your target market. Plus, your customers can be one of the best sources for criticism. It’s actually a gift if you can avoid taking the negatives personally. Survey your customers. Put together a competitive matrix. The worst thing you can do when you’re facing challenges is isolating yourself from your customers and ignore your competition. The freedom to express concerns, opinions, and ideas will allow people in an organization to speak up. Their feedback is going to help you move faster and more efficiently. If you have a team in place, bring them into the discussion. You hired them to be experts in their area; use their expertise to navigate and dig deeper into underlying causes of problems and potential solutions. Don’t do your SWOT analysis or design thinking work by yourself. If you’re running your business solo, at least bring in a trusted mentor. SCORE offers a free business mentorship program if you don’t already have one. It can also be helpful to connect with a strategic business advisor, especially if business financials aren’t your strongest suit. Quoting Stephen Covey, who said that “strength lies in differences, not in similarities,” Forbes also discusses the importance of diversity when it comes to problem-solving in business. The more diverse a team is, the better able they are to come up with innovative solutions to the problems faced by the organization. In fact, it has been found that groups that show greater diversity were better at solving problems than groups made up specifically of highly skilled problem solvers. So whomever you bring in to help you problem solve, resist the urge to surround yourself with people who already agree with you about everything. You do your SWOT analysis and your design thinking exercise. You come up with a set of strong, data-driven ideas. But implementing them requires you to adjust your budget, or your strategic plan, or even your understanding of your target market. Are you willing to change course? Can you change your mind? As you grow your business, you’re essentially a detective, learning more and more about your customers, your team, and what it will take for your business to thrive. Don’t be afraid to be nimble. Doing Lean Business Planning—the process of revising your business strategy regularly—is much more efficient than writing an epic business plan once a year. You don’t want to change course every week, and you don’t want to fall victim to shiny object thinking. But you can strike a balance that allows you to reduce your business’s risk, while keeping your team heading in the right direction. Along the way, you’ll make strategic decisions that don’t pan out the way you hoped. The best thing you can do is test your ideas and iterate often so you’re not wasting money and resources on things that don’t work. That’s Lean Planning. When you’re trying to solve a serious business problem, one of the best things you can do is build a few different financial forecasts so you can model different scenarios. You might find that the idea that seemed the strongest will take longer than you thought to reverse a negative financial trend. At the very least you’ll have better insight into the financial impact of moving in a different direction. The real benefit here is looking at different tactical approaches to the same problem. Maybe instead of increasing sales right now, you’re better off in the long run if you adopt a strategy to reduce churn and retain your best customers. You won’t know unless you model a few different scenarios. You can do this by using spreadsheets, and a tool like LivePlan can make it easier and quicker. While you’re working to solve a challenging business problem, pay particular attention to your cash flow and your cash flow forecast. Understanding when your company is at risk for running out of cash in the bank can help you be proactive. It’s a lot easier to get a line of credit while your financials still look good and healthy, than when you’re one pay period away from ruin. If you’re dealing with a serious issue, it’s easy to start to get tunnel vision. You’ll benefit from maintaining a little breathing room for your business as you figure out what to do next. When you’ve gathered all the information you need and generated a number of ideas and do some financial modeling, you might still feel uncertain. It’s natural—you’re not a fortune teller. You’re trying to make the best decision you can with the information you have. Use this sort of framework to put everything you’ve learned out on the table. If you’re working with a bigger team, this sort of exercise can also bring people to the table so they feel some ownership over the outcome. How will you know your problem is solved? And not just the symptom—how will you know when you’ve addressed the underlying issues? Before you dive into enacting the solution, make sure you know what success looks like. Decide on a few key performance indicators. Take a baseline measurement, and set a goal and a timeframe. You’re essentially translating your solution into a plan, complete with milestones and goals. Without these, you’ve simply made a declaration. You need those goals and milestones to make your plan real. The key to effective problem-solving in business is the ability to adapt. You can waste a lot of resources on staying the wrong course for too long. So make a plan to reduce your risk now. Think about what you’d do if you were faced with a problem large enough to sink your business. Be as proactive as you can. Editor’s note: This article was originally published in 2016. It was updated in 2019.